Jesus says that His Kingdom is not of this world. There is a Kingdom and there is a King and He rules and reigns on His throne. Some in eschatological circles would have you believe that the enemy is not yet crushed but he is crushed. Some would tell you that a future physical kingdom has to be established on this earth for the fulfillment of previous prophecies but they are all fulfilled in Christ. His was the victory at Calvary. The power of Satan was crushed at Calvary. There was total victory at Calvary. The power of the enemy was fully and forever vanquished right there. Any teaching that says differently is an assault on the totality of Calvary and the resurrection of Christ. The nations have not been deceived in these last days but have been willfully ignorant and rebellious to the Word of God and the victory of Calvary. You see brothers and sisters, salvation has come and strength and the Kingdom of our God and the power of His Christ. All this came at Calvary. The accuser of the brethren was cast down, exposed and humiliated at the cross. Now with great rage he began his war against the saints but he was restrained because they overcame Him by the Blood of the Lamb and the Word of their testimony and the fact that they loved not their lives even unto death. There is coming a time when he will not be restrained in his war against the saints. For these the last of the last days are coming upon us and the Scriptures say we, the saints around the world, the Body of Christ, must be delivered into his hands and he will overcome us. And it was given unto him to make war with the saints, and to overcome them: and power was given him over all kindreds, and tongues, and nations. (Rev 13:7) Now that word overcome in the Greek means to conquer. And the world will rejoice and celebrate the seeming victory, just as the hordes of hell must have celebrated their ” victory,” at Calvary. You see, for a time, as Jesus hung there dead upon the cross, all seemed lost. Yet the Father had allowed the Son to suffer and die for you and I. Yet brothers and sisters we know how the story ended at Calvary! And we know how the story ends in Revelation. And they shall see his face; and his name shall be in their foreheads. And there shall be no night there; and they need no candle, neither light of the sun; for the Lord God giveth them light: and they shall reign for ever and ever. (Rev 22:4-5) And so brothers and sisters, stand strong in the Lord and in the power of His might. The time is coming soon when we shall be called to face the full fury of hell and all of its hordes as it makes its last stand, but the victory has already been won. Their fate is sealed. For a few moments in time hell shall rejoice but only for a moment. 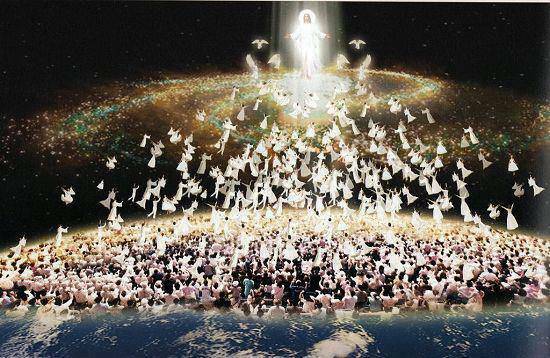 Our Christ shall come in all His glory in the sky for every one to see. We shall be with Him and those few saints still alive here on earth shall join them in the sky as the Lion of Judah comes to end it all and establish for all time that which begun at Calvary. You have the power today brothers and sisters, walk in it. Let no lie from hell rob you of your sight and your joy and your peace. You are covered by the Blood and you are a living epistle read of men, a witness to the world, and you love not your own lives or you would have never given it up in the first place to be born again. He who loses His life for Christ’s sake shall gain eternal life. We do not have to be martyred to “lose our lives,’ but their must be a willingness in us to give our all for Him. This is the power, this is the Kingdom and this is the glory and all victory flows from this. This entry was posted on April 13, 2015 at 9:47 am	and is filed under Christian, christian living, Christianity, church of scotland, Daily devotional, Devotions, end times, Jesus, pentecostal, prophecy, revival, the remnant, the state of the church, theology. Tagged: Calvary, not of this world. You can follow any responses to this entry through the RSS 2.0 feed. You can leave a response, or trackback from your own site. “We walk in power and the victory of the kingdom of Christ.” It has always perplexed me that so many Christians do not understand this truth. I guess it is because of ‘religious’ traditions passed down from one generation to another. Amen to this article.